Howard Herman Ruede was born in Bethlehem, Pennsylvania, on June 25th 1854. Ruede worked as a printer or typesetter in Bethlehem until his immigration to Kansas in March of 1877 at the age of twenty-two. 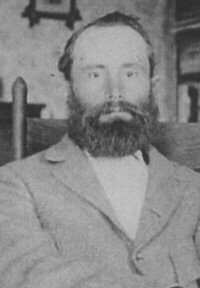 Ruede homesteaded on a parcel in Kill Creek Township, Osborne County, until he moved into the town of Osborne in 1901. He wrote numerous letters home during the first year and a half of his time as a homesteader. These letters, later compiled into the book Sod-House Days by John Ise, serve as a valuable primary source on the every day life of a homesteader in Kansas. Ruede’s letters chronicle his attempts to improve his own land claim while earning cash by working for neighbors and as a typesetter and correspondent for the local newspaper, The Osborne County Farmer. The letters show Ruede’s struggle to stay out of debt and get ahead, the difficulties of digging a well, and the hardships and pleasures of starting a new life on the prairie. After moving to town, Ruede worked for the newspaper full time until his death. A lifelong bachelor, Ruede remained close to his family his entire life. He passed away on April 9th, 1925, at his home in Osborne, Kansas, after a prolonged illness. 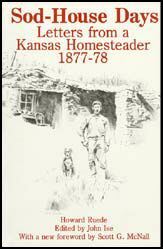 Sod-House Days: Letters from a Kansas Homesteader 1877-78 (University of Kansas Press, 1937) Edited by John Ise. "The sky turned to a pale, bright yellow-green, and a good deal of hail fell. Some of the stones were as big as hazelnuts. I lay on the bed and heard it beat against the door until I fell asleep. The storm came from s.w., and the west wall leaked a little, the water running under the sod because the bank of earth from the excavating had not been removed. The roof did not leak at all, but the rain beat in at the door so that there was about an inch of water over 1/4 of the room." "... (Our household goods now include): 2 buckets, 1 crock, 1 earthen dish, 1 saucepan, 1 spider, 1 tin dish, 3 pie plates, 3 china plates, 3 pair knives and forks, 3 spoons, 3 cups and saucers, 1 cracked china cup for salt, and a tin cup! How's that for an outfit! Then we have an axe and shovel. That is all we have. No, there is a sack of cornmeal, and a couple of ropes we found." "The folks here have no shoe scrapers and consequently the houses get pretty dirty in wet weather. As to my catching cold and getting sick-- why, if I catch cold one day, the wind takes it away the next. I can stand more wet feet here than at home, and can sleep in an awful drafty room without taking cold. Underclothes I don't wear. I quit that about the middle of April; and socks there are none to wash, as they have also been discarded. My heel is getting well now, and don't trouble me much." "Yesterday morning we had a heavy fog, and when the sun broke through, there was a "fog bow" in the west--a perfect semi-circle, and as white as snow. ... I never saw so many sunflowers in one place as I did near Bull City last Sunday."